A HIGH SHINE SUPPLEMENT THAT CONTAINS 7 PRODUCTS IN 1! Mobile site - please note that if you are viewing on a mobile device - please click the tiny arrow top right of your screen for the drop down purchase menu. MUD FEVER GONE! Typically mud fever disappears in the first month of feeding Compete. This is incredible effect is due simply to the superior nutrition that quickly boosts health and immune response. Compete is total system support for hard working horses, or even horses that need a bit more condition, strength, or help from recovering from illness. Compete offers everything your horse needs on a daily basis for optimum health and it is unnecessary to feed any other mineral or probiotic supplements. Compete is 100% organic and helps condition and produce a high shine! Feeding Compete can help protect your horse from laminitis, mud fever, rain scald, photo sensitivity, warts, sarcoids, some forms of colic and other issues from a nutritional angle, and can prolong your horses competitive life. Great value! Compete contains 7 organic supplements for not much more than what you might be paying for organic magnesium on its own! Customers routinely tell us when feeding Compete, Mega Build or Breed & Grow that their feed bill typically halves. Long term by even more. The reason being that the horse's digestion becomes more and more efficient, and with optimum health, they are able to get more out of the feed you put in. 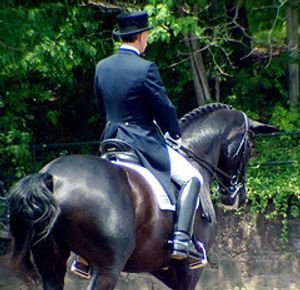 Other benefits are darker, finer coats, and horses tend to lose their winter coats typically a month earlier. Some horses when receiving Compete for the first time during mid winter will shed their coats almost straight away. Skin and hoof quality is improved and horses shine even in winter. 1 Trace minerals all in organic proteinate form. NOW ALSO IN SELENIUM FREE FORMULA! COMPETE - Selenium Free - is now available. Ideal for those feeding recommended amounts of premixed feeds high in selenium, or those who fertilise their property with selenium. Formula 2 - COMPETE is available in a 1 month supply (1.5kg) or 3 month supply (4.5kg). Directions - feed 2 scoops a day, ideally 1 at night and 1 in the morning. If extra calming effect is needed on occasion, feed both scoops in the morning. Customers are consistently telling us that mud fever, rain scald, warts and other opportunistic infections disappear in the first 1-2 months of using Compete. COMPETE contains a full spectrum of relevant Bio Plex® organic minerals including Chromium, Magnesium, natural selenium yeast, as well as patented functional nutrients to maintain gut health, muscle development and function, and improve the immune response supporting natural defences essential for optimum performance.